"Blessed be God in His angels and in His saints." O Holy St. Anthony, gentlest of Saints, your love for God and Charity for His creatures, made you worthy, when on earth, to possess miraculous powers. Miracles waited on your word, which you were ever ready to speak for those in trouble or anxiety. Encouraged by this thought, I implore of you to obtain for me (state request here). The answer to my prayer may require a miracle, even so, you are the Saint of Miracles. O gentle and loving St. Anthony, whose heart was ever full of human sympathy, whisper my petition into the ears of the Sweet Infant Jesus, who loved to be folded in your arms; and the gratitude of my heart will ever be yours. Amen. Say once a day for nine days. 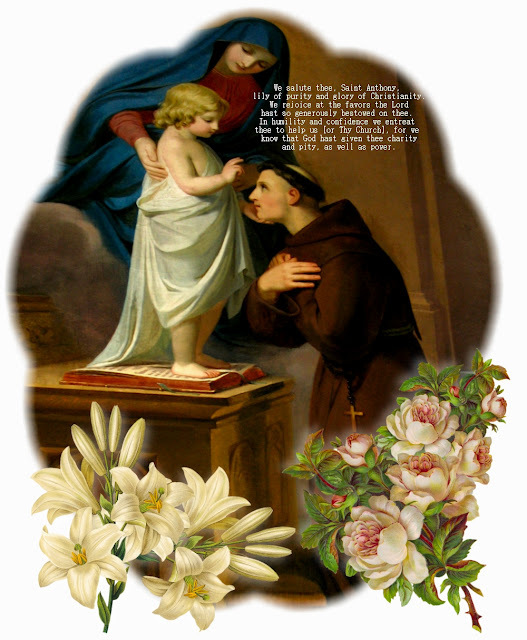 Some pray a Novena to St. Anthony on thirteen consecutive Tuesdays, per the instructions of Pope Leo XIII, or on all Tuesdays.O White lily of purity, sublime example of poverty, true mirror of humility, resplendent star of sanctity. O glorious St Anthony, who didst enjoy the sweet privilege of receiving into thy arms the Infant Jesus, I beseech thee to take me under they powerful protection. Thou in whom the power of working miracles shines forth among the other gifts of God, have pity upon me and come to my aid in this my great need. Recite one Our Father, one Hail Mary, and one Glory Be. Dear St. Anthony, you are the patron of the poor and the helper of all who seek lost articles. Help me to find the object I have lost so that I will be able to make better use of the time that I will gain for God's greater honor and glory. Grant your gracious aid to all people who seek what they have lost---especially those who seek to regain God's grace. Amen. Lord have mercy. Lord have mercy. Christ have mercy. Christ have mercy. Lord have mercy. Lord have mercy.Christ, hear us. God, the Father of Heaven, have mercy on us. God, the Son, Redeemer of the world, have mercy on us. God, the Holy Spirit, have mercy on us. St. Anthony of Padua, pray for us. St. Anthony, glory of the Friars Minor, pray for us. St. Anthony, ark of the testament, pray for us. St. Anthony, sanctuary of heavenly wisdom, pray for us. St. Anthony, destroyer of worldly vanity, pray for us. St. Anthony, conqueror of impurity, pray for us. St. Anthony, example of humility, pray for us. St. Anthony, lover of the Cross, pray for us. St. Anthony, martyr of desire, pray for us. St. Anthony, generator of charity, pray for us. St. Anthony, zealous for justice, pray for us. St. Anthony, terror of infidels, pray for us. St. Anthony, model of perfection, pray for us. St. Anthony, consoler of the afflicted, pray for us. St. Anthony, restorer of lost things, pray for us. St. Anthony, defender of innocence, pray for us. St. Anthony, liberator of prisoners, pray for us. St. Anthony, guide of pilgrims, pray for us. St. Anthony, restorer of health, pray for us. St. Anthony, performer of miracles, pray for us. St. Anthony, restorer of speech to the mute, pray for us. St. Anthony, restorer of hearing to the deaf, pray for us. St. Anthony, restorer of sight to the blind, pray for us. St. Anthony, disperser of devils, pray for us. St. Anthony, reviver of the dead, pray for us. St. Anthony, tamer of tyrants, pray for us. From the snares of the devil, St. Anthony deliver us. From thunder, lightning and storms, St. Anthony deliver us. From all evil of body and soul, St. Anthony deliver us. Through your intercession, St. Anthony protect us. Throughout the course of life, St. Anthony protect us. V. St. Anthony, pray for us.